Mrs. Jo van Gogh-Bonger, Amsterdam; sold 1912 to (Artz & De Bois); 1918 to (J.H. de Bois Gallery, Haarlem); on consignment 1918 with (Kunsthandel W. Walrecht, The Hague). H. Wiegersma, Deurne, by 1933; (sale, London, Sotheby's, 25 November 1959, no. 80); Bryan L. Hunter, London; (sale, London, Sotheby's, 23 November 1960, no. 23); Mr. and Mrs. Paul Mellon, Upperville, VA; gift to NGA, 1992. Vincent van Gogh Leben und Schaffen, Dokumentation, Gemälde, Zeichnungen, Villa Hügel, Essen, 1957, no. 270. 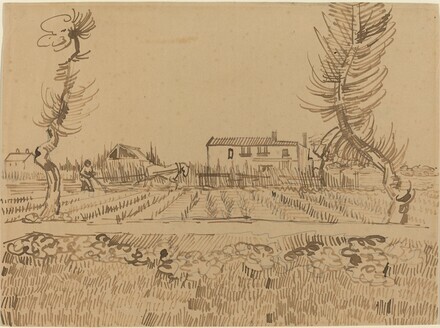 Vincent van Gogh, Musée Jacquemert-André, Paris, 1960, no. 105. French Paintings from the Collections of Mr. and Mrs. Paul Mellon and Mrs. Mellon Bruce, National Gallery of Art, Washington, 1966, no. 240. Faille, Jacob Baart de la. The Works of Vincent van Gogh, His Paintings and Drawings. Revised ed. Amsterdam: Meulenhoff International, 1970. Hulsker, Jan. The Complete Van Gogh: Paintings, Drawings, Sketches. Amsterdam, 1977: 309, no. 1374. Heijbroek, Jan Frederik. Kunst, kennis en commercie: de kunsthandelaar J.H. de Bois (1878-1946). Amsterdam, 1993: 206. Silverman, Debora. Van Gogh and Gauguin: the Search for Sacred Art. New York, 2000: 66, fig. 29.